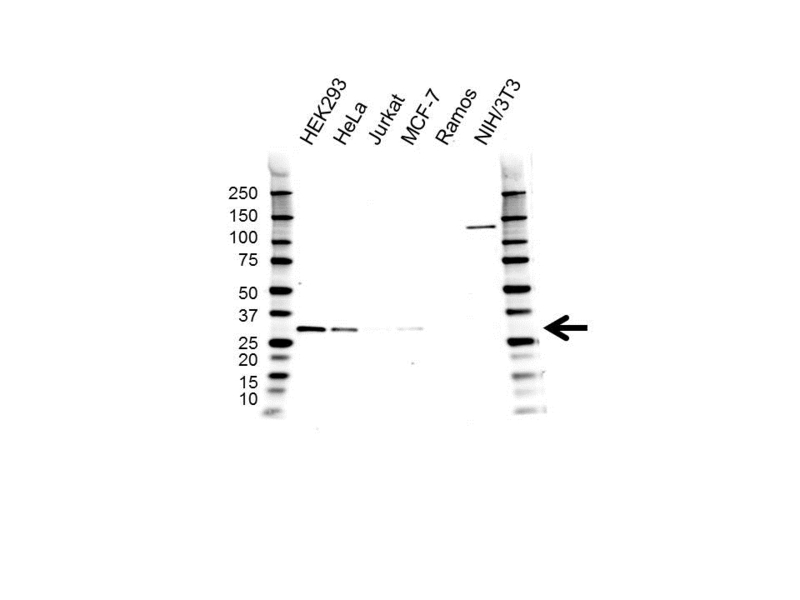 Western blot analysis of whole cell lysates probed with CDK4 antibody (VMA00520) followed by detection with HRP conjugated Goat anti Mouse IgG (1/10,000, STAR207P) and visualized on the ChemiDoc MP with 200 second exposure. Arrow points to CDK4 (molecular weight 30 kDa). Mouse anti Human CDK4 antibody recognizes the cyclin-dependent kinase 4, also known as cell division protein kinase 4. The protein encoded by CDK4 gene is a member of the Ser/Thr protein kinase family. This protein is highly similar to the gene products of S. cerevisiae cdc28 and S. pombe cdc2. It is a catalytic subunit of the protein kinase complex that is important for cell cycle G1 phase progression. The activity of this kinase is restricted to the G1-S phase, which is controlled by the regulatory subunits D-type cyclins and CDK inhibitor p16 (INK4a). This kinase was shown to be responsible for the phosphorylation of retinoblastoma gene product (Rb). Mutations in CDK4 as well as in its related proteins including D-type cyclins, p16 (INK4a) and Rb were all found to be associated with tumorigenesis of a variety of cancers. Multiple polyadenylation sites of CDK4 have been reported (provided by RefSeq, Jul 2008). Mouse anti Human CDK4 antibody detects a band of 30 kDa. The antibody has been extensively validated for western blotting using whole cell lysates.